This is another reality-bending mind-twister that gives Inception a run for its money. 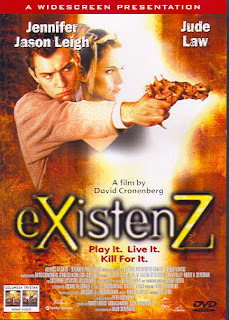 Instead of the dreams in Inception, eXistenZ is about games. Calling them "computer games" would be misleading however, as this starts out in an alternate reality from the very beginning, in a world where technology has evolved into living organisms that you physically connect to your body. This is the last great film directed by infamous auteur David Cronenberg, before he decided he wanted to make money, and strayed into the forgettable mash of the mainstream, with pop-films like A History of Violence and Eastern Promises. But with eXistenZ he was still oozing of wonderful weirdness, for example by making sure there are no flashing computer screens or knobs, buttons or dials to be turned at any point of the film. The gadgets in eXistenZ are not machinery; they are pulsating, breathing, extra limbs. The cinematography plays a major part in the experience too, as everything seems to be in the past, but still somehow in the future, culminating in a sort of tangent universe that might only be compared to the ambient atmosphere of Donnie Darko. "(...) the last great film" of David Cronenberg, "before he (...) strayed into the forgettable mash of the mainstream, with pop-films like A History of Violence and Eastern Promises"? OK, it is something like "The Fly meets The Tenant meets Oedipus", but is it really bad enough not to be considered great? I haven't seen Spider since it first came out, but I remember being greatly disappointed at the time. To me, it felt like a film Cronenberg did as a mere job, without any passion for the subject. Ask yourself this: If exactly the same movie had come from a different director, would you still have remembered it, or would it have caught some attention and quickly forgotten, like so many other slightly interesting films which lacked the final oomph! Well, it seems you developed a successful technique for uncritical admirers, :) so the same inertia of my mind which hurried up years ago to put Spider in that 'Oh, he did something different, nice' drawer now have to admit - it is correct, what you wrote. It is definitely not what (by my book) Black Book is for Verhoeven. 1. Do I remember the beginning? 2. Do I remember the end? 3. Do I remember the scenes in between? 4. Do I remember the story? Well, it hardly reaches 37.5%. And I find it 75% to be the threshold.